NARS have been operating since 1970 and continue to provide enhanced care thoughout the county. Read more about NARS in our brief history below. A young woman, three months pregnant, died after her car hit a tree in dense fog. The District Nurse living nearby heard the crash and called me to the scene. The patient was trapped with severe facial and possible neck injuries, lapsing in and out of consciousness, choking on the vomit of her recent meal. Having freed her (and the unconscious dog also found trapped under her seat) she had a twelve mile journey to the nearest accident unit. She died as the ambulance neared the doors, and could not be resuscitated. She succumbed to respiratory obstruction, due to food inhalation. Her husband and the dog survived. The uncommon thing about this accident was that a doctor was called. The first we usually knew about most accidents was when the patient was discharged from hospital, or perhaps from the report in the local paper. Ambulance staff said they often had wanted a doctor to attend, but had no means of identifying the nearest one, or of contacting him. Radio-communications were rare on ambulances. There were no suckers or endotracheal tubes in the ambulance, nor did General Practitioners carry them. Most doctors had sticky plasters, lint, a bandage or two, injections, and metal/glass syringes, but no intravenous fluids or transfusion equipment, oropharyngeal airways, or splints. Nor had they worked in Casualty departments that prepared them for difficult diagnostic and management decision-making at the roadside. Ambulances were as ill-designed as they were ill-equipped, in some areas manned by only a driver, with minimal training in first aid and none in CPR. There were no statistics on the numbers dying in transit, for death could only be certified by a doctor at the site or on arrival at the hospital. Many doctors recently trained in hospital techniques were now working in general practice. Properly equipped, those doctors could prevent shock from blood loss by setting up a drip with the new plastic giving-sets before veins had become collapsed; new IV fluids were also becoming available. Doctors could prevent or treat airway obstruction or lung collapse which could be fatal within a very few minutes; they could monitor head injury and relieve pain – if only they could be got to the scene in time. It seemed logical to suggest that the police or ambulance control centres could alert the nearest doctor as well as the ambulance when an emergency call came in. Nor were road accidents the only occasion when specialised skills and equipment might be used. Accidents at work (especially farming injuries, which often occurred a long and difficult journey from hospital facilities), at sport and leisure, and at home, were equally common. Newborn babies may need resuscitation, so infant-sized airways and larygoscopes were necessary; haemorrhagic shock from bleeding ulcers, ante- and post-partum haemorrhage, etc., could be treated by intravenous fluids with live-saving results. Greater expertise and better equipment would undoubtedly contribute to raising general practice standards and thus benefit the community as a whole. Communications: how can the doctor be alerted? Availability: how can medical care best be organised? Training: what extra training is necessary for roadside work, for new techniques and materials? Equipment: what is there, and how can it be provided? Payment: for services, equipment, organisation, time. 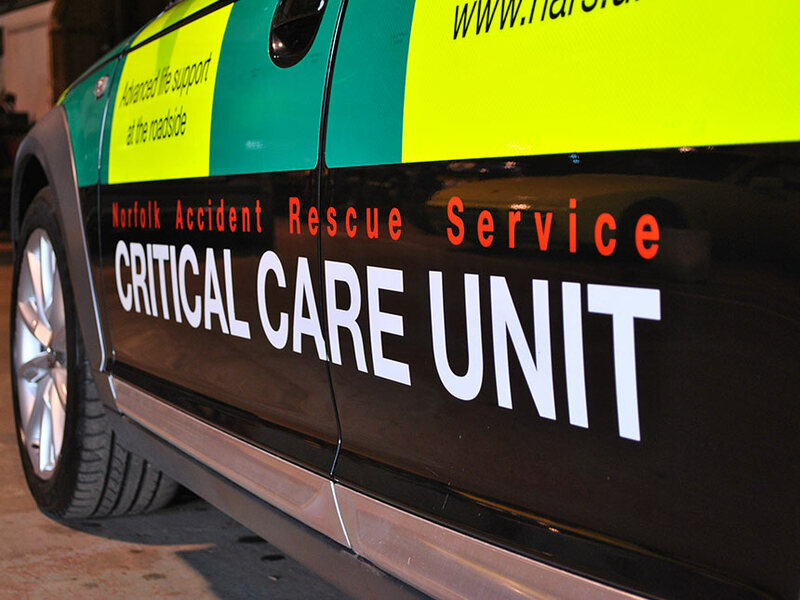 The Norfolk Accident Rescue Service went operational on 1st October 1970, after only five months of planning and organisation, with 71 General Practitioners participating, covering well over 80% of the County. Its Constitution read “that the Service is for the provision in the geographical county of Norfolk and areas contiguous thereto of immediate medical treatment and care to persons in need by reason of accident or other emergency”. Forty-seven years later, the NARS Constitution still contains the same statement. But much else has changed. In the intervening years, new medical specialists were emerging: doctors with enhanced skills in pre-hospital medicine and immediate care; Critical Care Paramedics – paramedics who have undergone significant additional training to deal with the most serious, life-threatening injuries and illnesses. This new breed of emergency practitioner was able to conduct advanced procedures at the scene, administer specialised pain relieving drugs and sedate patients when required. Road traffic collisions continue to occur, with 391 people ‘killed or seriously injured’ on Norfolk’s roads in 2013-14. Cardiac arrest continues to be the ultimate medical emergency, highly time critical and still fatal for over 70% of victims. Clearly, there was still a need for a team of highly trained, qualified and experienced emergency medical practitioners, who would be able to quickly attend the most serious incidents, to support and augment the ambulance crews. At the same time, the ambulance service recognised the need to be able to identify the most serious cases and dispatch the appropriate resources. The solution was the Critical Care Desk (CCD). The CCD filters all incoming 999 calls and identify those which might benefit from specialist skills. The CCD also accepts Crew Requests: a call from an ambulance crew who recognise that the patient(s) would benefit from the enhanced skills, drugs and equipment that a NARS member would bring. NARS doctors and Critical Care Paramedics are still dispatched from home, in their own cars, but today their cars are equipped with blue lights and sirens, paid for by the charity. They have been trained to drive under emergency conditions, have advanced driving qualifications and have additional ‘blue light’ insurance, again paid for from the charity’s funds. NARS doctors and paramedics still provide their services voluntarily. But there was recognition that the somewhat random availability of NARS members could be an issue. Frequently, a call would come in which needed a NARS member to attend, but the person might not be available. What was needed was a unit which would be ‘on call’ at the busiest times: a vehicle manned by skilled personnel, carrying all the necessary equipment and drugs, ready to go at a moment’s notice. The concept of a NARS Rapid Response Vehicle (RRV) was proposed in early 2014 and a campaign was launched to pay for it. After a period of intense fund-raising and the receipt of some generous donations, the charity decided to purchase a second-hand Audi A6 Allroad – an estate car which is fast, has four wheel drive and which can negotiate limited off-road conditions. The arrival of the RRV represented the beginning of a new era for NARS. It extended our capability and allows our members to work planned shifts. Because the crew are at full readiness, response times are shortened and patients reached quicker. The RRV also helps to solve another significant problem. At present, there is no framework within the NHS to permit paramedics to acquire the additional training required to progress towards Critical Care Paramedic. The RRV allows experienced paramedics to be taken out on active shifts, to acquire vital hands-on experience of serious medical and trauma emergencies. NARS currently has a waiting list of over fifty paramedics who are willing to give up their spare time to gain these skills. The arrival of the RRV is not an end in itself: it is the beginning of a continuing process. NARS has developed ambitious plans to enable the continuous provision of the highest levels of care to those most in need. Running costs need to be met, so the charity is in constant need of funds to keep operational. But the goodwill of the people of Norfolk has kept us going for nearly fifty years and we hope that will continue into the future. All the members are volunteers and offer their services free of charge in their spare time. The organisation is funded solely by donations – the organisation receives no government or health service funding.